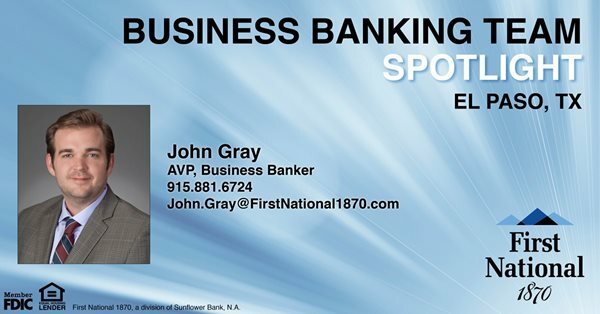 John Gray has joined First National 1870 as assistant vice president and business banker. In this role John builds relationships to support the growth of small and medium-sized businesses in both El Paso and Las Cruces. He has over eight years of experience in financial services providing commercial financing and risk management for a range of businesses and investors. John’s expertise includes identifying market opportunities and developing credit structures for working capital and equipment financing. First National 1870 is a division of Sunflower Bank, N.A. and has six locations in El Paso and Las Cruces.